2007 Prieler Pinot Blanc “Seeberg” Burgenland, Austrian White. 1999 Gaston Chiquet Champagne “Special Club” Brut, Dizy, France. 2008 Ryan Chenin Blanc Arroyo Seco, Monterey County. 2008 Rochioli Sauvignon Blanc Russian River Valley. 2005 Bridesmaid Red Napa Valley. Cabernet Sauvignon Blend. January 22, 2010 6:30pm-8pm at Rancho Cellars, Carmel. The wines of Bordeaux, a study in terroir and vintage featuring all red wines from the main regions of Bordeaux from the upper and lower Medoc, plus “Right Bank” and “Left Bank.” All the wines being shown and tasted scored at least 90 Points by the famed wine critic Robert Parker. 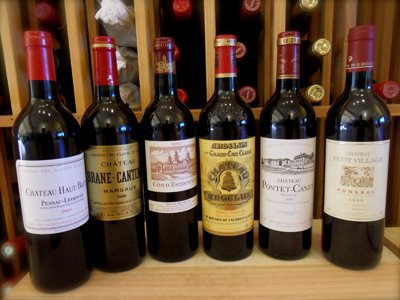 Learn about vineyards, the grapes, the soils, and the 1855 Classification and the Chateaux of this special wine area. The 2000 vintage was one of the classic years and was rated right up there with some of the best of century, including the fabled 1982 vintage. Only a small number of spaces will be available for this limited presentation and only pre-paid reservations will be taken. This Rancho Cellars Event hosted by Jacques Melac is a rare opportunity for the wine-buying enthusiast that wants to learn about vintage wine in a fun and educational way. Conducted in a serious tasting format with a knowledgeable guide giving commentary, plus time for self evaluation of each wine. This rare and special seminar is part of a long standing and now continuing educational tradition at Rancho Cellars to bring the world’s greatest wines and winemakers to our local area. Don’t miss this the chance to try some of the world’s most famous wines from France’s premier wine region with a decade of cellaring, and from a classic year and book your spot early. 2000 Chateau Pontet-Canet Pauillac, Bordeaux , France. 92 Points, Parker. 2000 Chateau Petit Village Pomerol, Bordeaux, France. 90 Points, Parker. 2000 Chateau Brane Cantenac Margaux, Bordeaux, France. 92 Points, Parker. 2000 Chateau Haut-Bailly Pessac-Leognan, Bordeaux, France. 90 Points, Parker. 2000 Chateau Cos D’ Estournel Saint-Estephe, Bordeaux, France. 92 Points, Parker. 2000 Chateau Angelus Saint-Emilion, Bordeaux, France. 96 Points, Parker. ** Rancho Cellars has these wines for sale as well, with a limited amount available now online and some being sold the night of the event. 2005 Weingut Schloss Schonborn Riesling Spatlese “Hattenheimer Pfaffenberg” Monopole, Graflich Schoenborn’scher Eingenbau, Rheingau, Germany. 1987 Diamond Creek Cabernet Sauvignon Volcanic Hill Vineyard Napa Valley. 2007 Copain Syrah “Tous Ensemble” Mendocino County, California. 2000 Domaine du Caillou Chateauneuf-du-Pape “Les Quartz” (Vacheron-Pouizin) Rhone, France.